Wow, how he has grown since you last posted a picture! How old is our library baby? I remember us all being aunties of him. Am I wrong or does he look like his sister? Can I just say it once? Is that red hair I'm detecting there? Is he grrrowin' into his namesake, then? 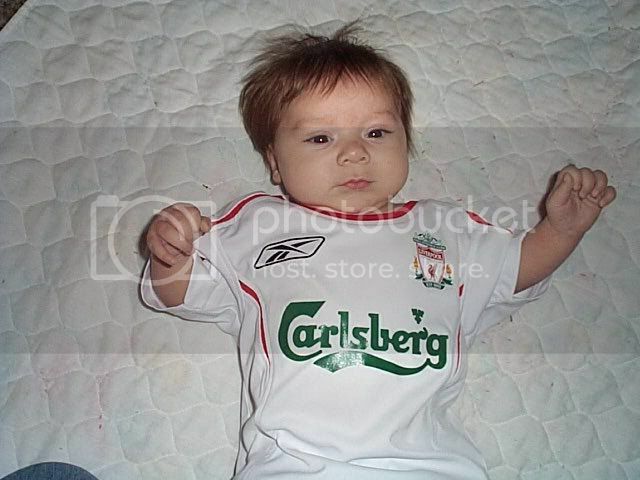 If he would become Liverpool's future star player this pic will be worth.... . Adorable, o how he's grown. Very cute Jenn. OMG Jenn!! Little Sean is so adorable!!! !